Sometimes what your true love needs is a little nip. A nip to their tastebuds that is, and candied ginger is a great vehicle for nipping. With Valentine’s Day around the corner I decided to play with some non-chocolate* possibilities for my true love. 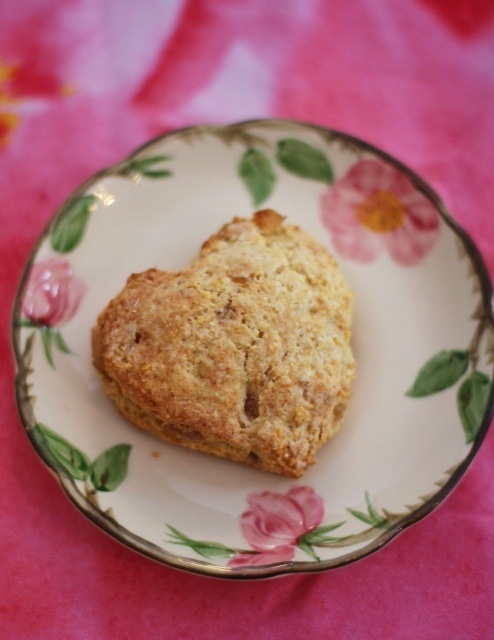 This recipe is a rift on a scone I’d had at the farmer’s market last summer. Filled with cornmeal and chunks of candied ginger it was crumbly-delicious with just the right amount of ginger zing. Nibbling as I strolled through the outdoor market turned out to be the perfect way to eat this scone since each bite ended with a small shower of crumbs. With Valentine’s day right around the corner all I can think about is how good it would feel to be a little bit warmer. Don’t get me wrong I love winter and for the most part I whine loudly when it gets too hot (like I did here and here and here) but come on Mother Nature – give us a break. 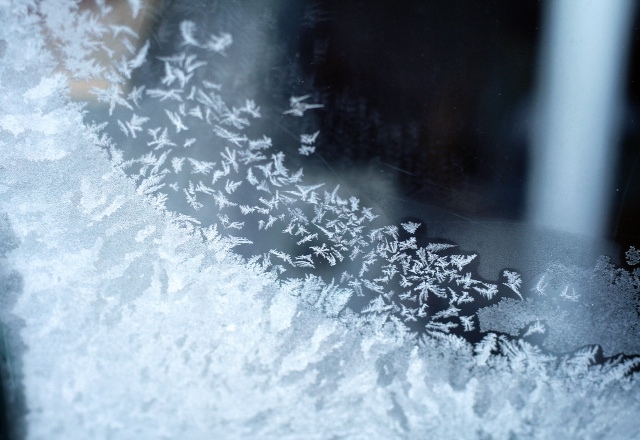 This morning it was -11ºF and tomorrow there’s another snowstorm scheduled to slam into the northeast. So I decided to make something sunny for my Valentine. Something that when you take a bite of it you taste the hot mediterranean sun on your tongue even if you can’t feel it on your back. I made him a bowl of tapenade. Olives, capers, anchovies, olive oil, and lemon juice – it just sings of summer in the south of France or Italy or Greece. Right now I wouldn’t be picky about visiting any one of those places, but alas I am not, instead I am in mid-winter Massachusetts. So I’ll put on another sweater, then scoop another spoonful of this edible black gold onto a cracker as I reach for a glass of wine. Pitting the olives is as easy as placing them under the flat side of a chef’s knife and leaning your hand onto it. The slight pressure cracks the olive and allows you to fish the pit out. I find it meditative, though if I had to make gallons of tapenade I’m sure I wouldn’t feel the that way. 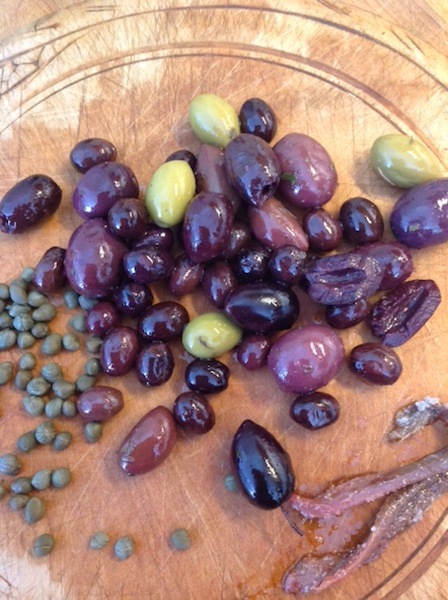 As with much of my cooking I like to layer the flavors so I use a mixture of olives – kalamata, niçoise, lucques, alphonso, gaeta, and a few hondroelias. I am able to find a nice selection at many supermarkets near the salad bar. Once you’ve pitted the olives (and the measurement is a guideline) zap the garlic, capers and anchovies in a food processor for a few pulses then add the olives, lemon juice and some of the olive oil. Continue to pulse until the olives are mostly smashed up, but not baby food. Adjust the oil until the mixture is smooth and scoopable. This is a wonderful hors d’oeuvre but don’t save it just for then – throw some into pasta along with chopped up parsley and a tablespoon or two of the pasta cooking water, spread a few dollops onto a pizza in place of the usual red sauce, try it as a condiment for broiled fish. 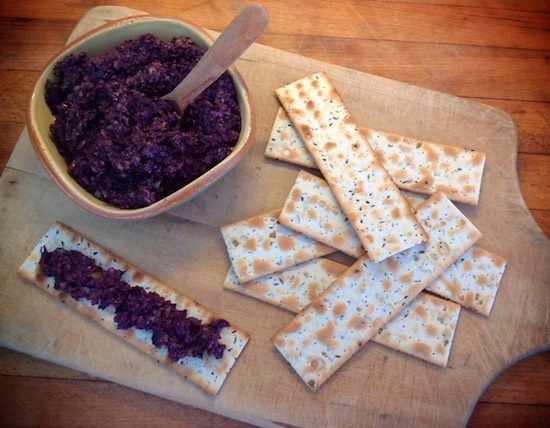 While I’m enjoying some tapenade I’ll also be dreaming about my other favorite type of black gold – compost – because when the compost arrives it means that spring is here (and winter is gone). 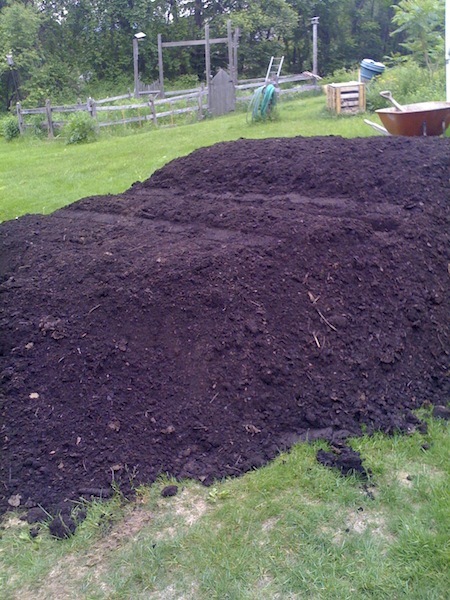 It will be time to plant my summer crops and perhaps, if it gets really hot, wish that it were winter again.